Cars on Blu-ray is one of the most impressive video and audio quality experiences that I have ever experienced out of the big screen and the 2006 movie by Walt Disney Studios is also rather impressive as well. I strongly believe that Cars should be used a reference Blu-ray to showcase the power of this amazing new high definition standard. With that said, Cars is the creation of Pixar Animation Studios which is directed by John Lasseter and stars Owen Wilson as Lightning McQueen, an arrogant and quirky racing rookie whose life is soon about to be questioned. It should also be noted that Pixar Animation Studios are also the geniuses behind "Finding Nemo" and "The Incredibles" with this current film using the same computer technology to create an almost surreal and awe-inspiring cinematic experience. Cars revolve around "cars", as Finding Nemo featured the underwater world of fish and The Incredibles, the world of super heroes and villains. Even though these cars are inanimate and soulless creations in the real-world, the developers have someone managed to portray real-world emotions which assists in drawing the viewer into this universe. Onto the story... when Lightning McQueen pushes himself to the limits in the legendary Piston Cup, the most unusual thing in racing history occurs, a three tied race. The organisers decide to hold another race in California a week from race day but unfortunately for Lightning McQueen, he accidentally ends up in Radiator Springs, a forgotten country town that features a plethora of strange and eccentric characters. As our hero unintentionally destroys the main street of Radiator Springs, he is forced to fix the road with old Betsty and soon discovers that the cars of this town are not so strange after all. Befriending an old tow truck called Tom Mater (Larry the Cable Guy), a former lawyer from California called Sally (Bonnie Hunt) and the mysterious Doc Hudson (Paul Newman), these strange characters give our arrogant hero the much needed boost he requires in life that life is not all about racing and living the fast lane. 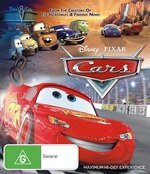 Featuring a star studded cast that includes Richard Petty, Cheech Marin and Michael Keaton to name a few, Cars is your classic Disney family movie that contains action, humour and adventure in a story for all ages and times on one of the most impressive video formats of all time, Blu-ray. The video quality of Cars on Blu-ray supports true 1080p High Definition Widescreen (16:9) which is truly an extraordinary experience as it is the most visually impressive Blu-ray disc that I have ever experienced. The pixels are so clear that some scenes in the movie such as when Lightning McQueens stumbles upon Doc's secret, even the fine dust particles can be seen. Match that with true Blu-ray sound and this movie is perfect in both the audio and video departments. In conclusion, Cars on Blu-ray is an amazing compilation which features perfect audio and video which will be used by some as a reference Blu-ray disc. A great story that can be enjoyed by everyone, especially children, Cars is the must have disc of 2008. The ultimate interactive dashboard interface, which appears in-movie giving the viewer a customised behind-the-scenes experience. incredibly detailed world of Cars, offering cool facts on the actual cars that serve the basis for each character in an engaging and fun game. Seamless navigation allows you to search for as many cars as possible while watching the movie, earning points for every car you find and unlocking Car Guides containing cool specs on each “Car-acter’s” make and model – all 217 of them! And, for the first time you will have the option to save your game allowing you to take the disc out, lay other great Disney Blu-ray movies, put your Cars Blu-ray Disc back in, and pick up right where you left off! ultimate in high definition picture and sound.